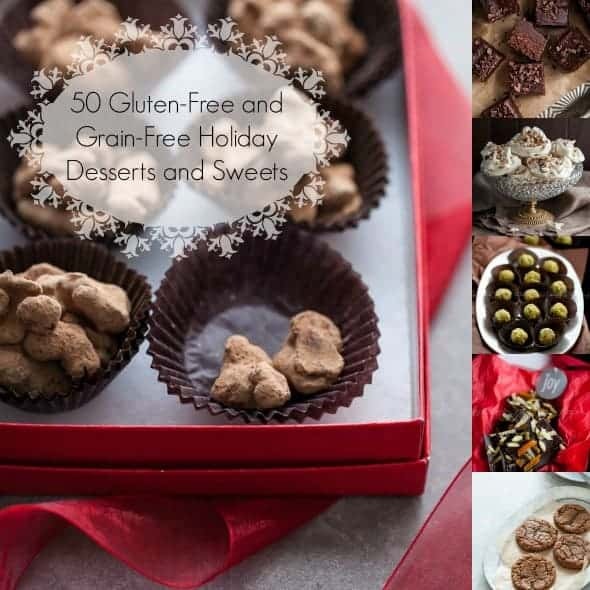 50 Gluten-Free and Grain-Free Dessert and Sweets Recipes to make this Holiday Season. So now that the holiday season has officially started let’s move straight to dessert shall we? 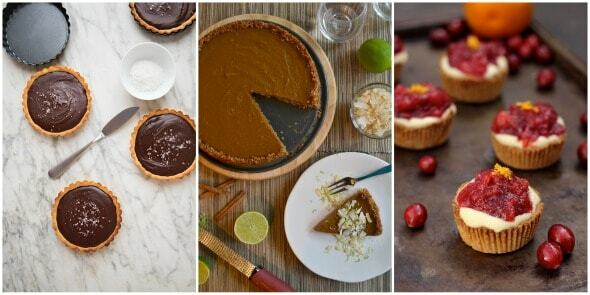 What better time of year is there to get cozy in the kitchen and start baking? I’d guess that many of you have even started pulling out your tried and true, family favorite recipes and are planning your gift boxes and goodie baskets full of homemade treats as we speak. Most likely there will be cookies, maybe fudge or a few loaves of fruited breads made very soon. There will be holiday parties and brunches and desserts to make for each. Let’s face it, this time of year it’s all about the food. 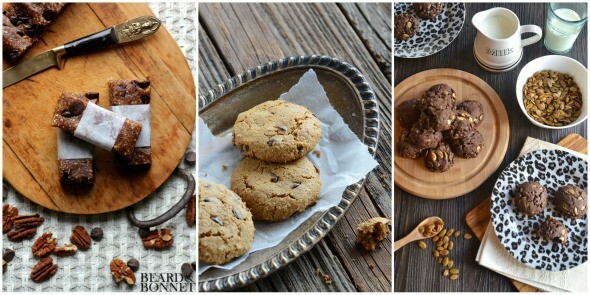 This year I hope to inspire you to create new traditions and fill your home with the tantalizing scent of homemade treats with these gluten-free and grain-free recipes from bloggers across the web. Let the baking and treat making begin! These zippy ginger molasses crinkle cookies are gluten-free, paleo friendly and filled with holiday spice. 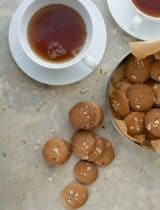 With their crackly tops and spicy complex flavor these cookies are high on my list of cold weather favorites. A good meringue is a beautiful thing; light as air, every bite a cloud of sweetness. Maple syrup and cinnamon add a rich warm flavor while toasted chopped almonds add crunch to these entirely refined sugar-free meringues. 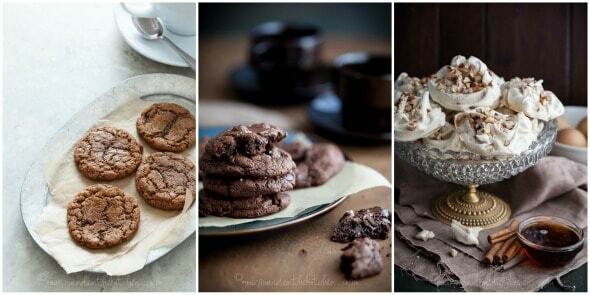 Deep, dark and rich, these double chocolate cookies are for true chocolate lovers. 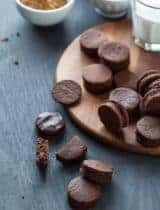 While we all have our favorite holiday cookies, it’s nice to mix in some new ones among old favorites, so I do hope you’ll make these this season, or for any occasion for that matter. Baked until lightly golden on the outside, but still creamy white on the inside they are bites of pure coconut goodness. 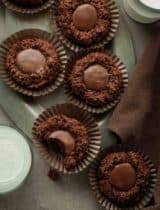 The combination of chocolate and coconut makes for a luxurious treat any Bounty or Mounds lover can attest to. This isn’t your traditional fudge recipe but it sure gives it a run for its money. 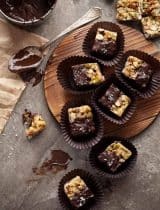 An easy no-cook raw fudge that’s topped with a layer of rich chocolate ganache and cacao nibs for extra crunch. Medjool dates are stuffed with a moist coconut filling and dipped in chocolate for an easy but impressive sweet treat. 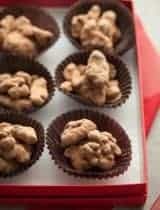 Package them up in a pretty box and you have homemade gift that’s sure to be remembered. Or, treat yourself and keep these on hand for an after dinner or mid-afternoon treat with a cup of tea. In my house there’s not a holiday that doesn’t involve a hefty dose of chocolate. These walnuts are glazed with maple syrup then truffled and dusted with cocoa. Good things come in small packages, right? And chocolate makes everything better? Well, then, these bite-sized chocolate-dipped treats are a very, very good thing. A mixture of caramelized nuts and seeds are dipped in dark chocolate and sprinkled with fleur de sel for a salty/sweet treat. Chocolate bark makes an elegant hostess gift or party favor for any holiday get-together. It’s simple to prepare and is a wonderful healthy indulgence. The confection we have come to associate with the word sugar-plum today primarily contains dried fruits and nuts combined with holiday spices. It signifies everything simple, sweet and delectable about the holiday season. 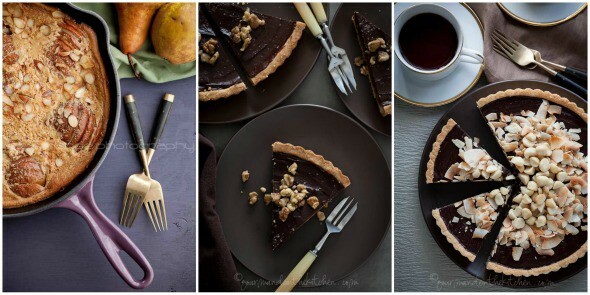 This dark chocolate coconut tart with its almond flour crust and macadamia nut topping is rich and silky and guaranteed to fulfill your chocolate cravings. 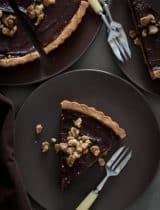 An almond shortbread crust and soft date caramel filling is topped with a rich chocolate ganache and finished with walnuts in this chocolate tart. A cross between a custard, a thick pancake, and a flan; it’s neither complicated nor intricate but it’s absolutely irresistible. In essence, it amounts to a moist crêpe-like batter studded with juicy pears. Pecan pie is the epitome of the holidays for me. After a savory meal, I get a cup of coffee, a slice of pecan pie and enjoy the conversation. The filling isn’t cloyingly sweet – just nice and subtle. The pecans are crunchy on top and the crust is tender and buttery. Cranberry Apple Maple Crisp (Gluten-Free, Grain-Free, Paleo) from With Food and Love I cook from my heart and I’m totally obsessed with seasonally fresh foods. So naturally cranberries and apples just had to be smothered in cinnamon and maple syrup and baked to bubbly perfection. I hope you enjoy this little bundle of goodness and much as I do. wOW, that is some impressive collection of recipes. I can't wait to try some of them. Thanks. Beautiful list. There are a bunch of really good looking recipes on here that I want to try now! Thanks for including me in the list Sylvie, much love. wow - this is inspiring! Wow, this is quite the lineup!! I am not a dessert person, but your impressive collection is going to tempt me into trying some! Thank you for including my Apple Marzipan Tart! What a terrific collection of holiday sweet recipes Sylvie - I'll be referencing this over the next few weeks. 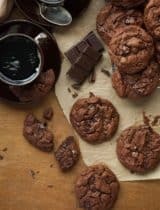 Thanks so much for including my peanut butter and dark chocolate drizzle cookies - these were a big hit last holiday season. Oh my! Delicious collection and so inspiring! Thanks so much for including my recipe! What a seriously gorgeous round up! A great round up. The one that took my eye was the chocolate bark with pumpkin seeds and ginger. Great collection of sweet treats. All were amazing! what an exquisite, artful, delectable display! how could it possibly be prettier?! Reading this just made me want some dessert! Thanks for including my donuts! Thanks for sharing my recipe!! Great round-up! 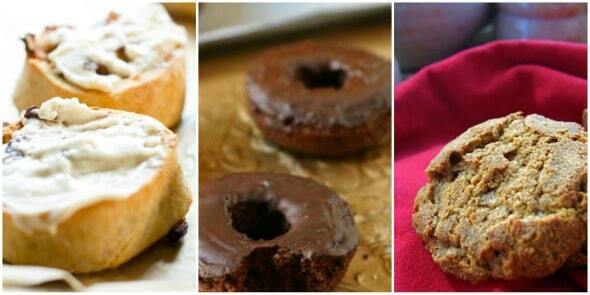 I'm pretty sure I don't know which one of these yummy desserts to bake first...everything looks amazing! Thank you so much for including my recipes!! This is probably the tastiest assortment of holiday desserts I have ever seen! Great round up! Sorry I never got around to sending you anything...crazy time of year. wow fabulous collection Sylvie!! pinned it!! Wow, this is such a great collection, thanks for sharing! My goodness! What an amazing resource for us to use and share! 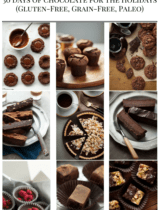 Thank you for compiling so many delicious recipes! Great roundup! This will be so helpful as I get my holiday baking must-haves together. Perfect list! Really helpful for my family members with allergies, and they all look divine! 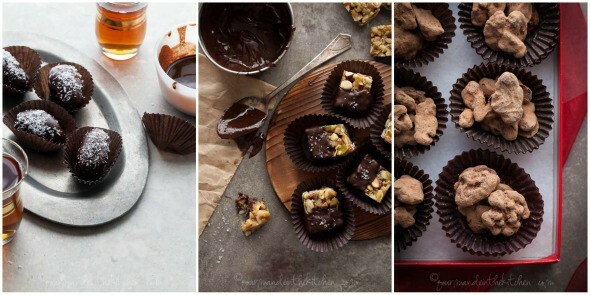 This is a gorgeous roundup of sweet treats! I'll take one of everything!!! Thank you so much for this round up! As someone who has just gone grain-free it's great to have all of these ideas for the holidays in one place! Absolutely love all these recipes! First of all, I'll try Chocolate Silk Pie! I prefer healthy food! And 'll definitely try these recipes. My family would love it! Thanks for sharing!